Welding Consumables - Cast Iron Electrodes. 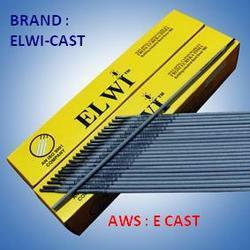 ELWI CAST is a graphite based electrode for laying non-machinable bead on cast irons. The electrode is ideal for welding machine bases, engine blocks, gears, & Pumps, Joining of broken cast iron parts & for repairing defects in foundry castings. ELWI NICU 7 is used for Shielded-metal-arc welding of monel alloys 400, R-405 and K-500. ELWI NIFE CL A is a versatile electrode with Nicke-Ferrous alloy core wire designed for producing a high strength, ductile, machinable, weld-matches colour of the base metal.